WB No. 245: EUREKA is a 20′ (6.1m) demountable (“take-apartable”) trimaran suitable for long-distance coastal cruising and adventure racing for one or two. Empty weight is approximately 500 lbs (230 kg), with a payload of up to 600 lbs (270 kg). We have drawn the boat with an aft “pedaling” cockpit, and a small cabin centered between the akas (crossbeams). 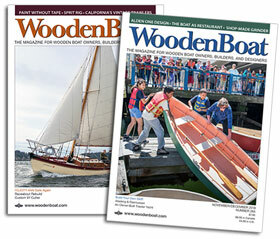 Both have steering stations: the first with joggle sticks (or vertical tillers connected to tiller lines or rods) and the latter with foot pedals—kayak style, with one pedal on each side of the centerboard trunk. The single berth flat sits directly above the trunk and runs forward, under the foredeck. We’ve drawn a kick-up centerboard and rudder to reduce the chance of damage in the event of grounding or hitting a submerged object, especially at speed. * The Bruce number is the square root of sail area (in square feet) divided by the cube root of displacement (in pounds). It relates power to weight, so is a predictor of potential speed. 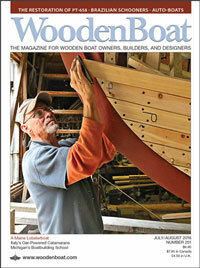 See more in Designs: Sketchbook, WoodenBoat issue 245.